Wilton Sanitation, Flesherton Ontario - Contact Us for roll off bins, porta-potty rentals, septic pumping, restroom trailer rentals, portable toiletsWilton Sanitation Inc.
ROLL-OFF BINS FOR JOBS OF ALL SIZES! Our roll-off bins are perfect for all renovations or demolitions, yard clean-up, estate clean-up, hoarding, spring cleaning, roofing projects, scrap steel removal and non-toxic waste removal. For commercial, industrial or residential sites. We Do NOT Accept: Electronics, tires, antifreeze and its containers, lawn fertilizers, oil filters and containers, paints and coating plus their containers, pesticides and their containers, pressurized containers, such as propane tanks and cylinders, oxygen and helium tanks, batteries, solvents such as thinners for paint, lacquer and contact cement, paint strippers and degreasers, portable fire extinguishers, fluorescent light bulbs and tubes, switches that contain mercury, mercury-containing measuring devices. 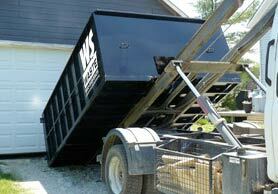 Give us a call and schedule delivery of our dumpster to your home, business or job site. Our professional staff will deliver a waste bin to your site for your use. Call us when the bin is ready for removal, and we'll come and pick up the waste bin and dispose of the contents properly. We accept Debit, Visa and Mastercard for your convenience. Our prices include delivery and pick-up. Disposal fees are extra. Please Call us Today for an Estimate or to Schedule Delivery! Don't see your location? Give us a call!